Today was the second trial run at Daglingworth in a week with Level 1 due to start at 9.30am and Level 5 at 11.30am. I arrived early at 8.15 for a 9.30 start and started to prepare for the day. Our Judges for Level 1 were Tina Schuster and Ali Brennan. Tina volunteered to run the outside searches and Ali had the inside. For once I had the luxury of having 2 scribes so Chris assisted Tina and Pauline was with Ali. Everybody had arrived and we started on time, which was a good as I expected a long day as we had 20 teams competing in the two trials. The morning session went very well and again we finished on time and then there was a short break whilst the scores where added up. It was very tight for first place as two teams both got 100 points and the winner won by 3 seconds over the four areas of search! The winner being Sue and Rio followed by Lynne and Tripp. The Level 5 trial started a few minutes late with Ali being the sole judge and her scribe for the afternoon was Paula. I think the teams found it a little hard as only 3 teams manged to get the bonus points on the first interior search. It was a beautiful afternoon and most of the teams were sat out in the sun. The exterior search was soon underway and the dogs appeared to be in good form and the handlers were beginning to step up as well. From the feel of things it was getting quite competitive and I enjoyed watching some of the searches. The final search was inside and I think Ali was finding it tough as many of the teams were very close to running out of time when they found the item which gave them a pass. We finished around 4.15 with Matilda and Mitford winning and Sarah and Hugo coming second. Unfortunately out of the ten teams who entered only one failed to qualify and that was by 1 point which must have been so frustrating for both of them!! I would like to thank Ali, Tina, Chris, Pauline and Paula for doing such a great job in judging and scribing and also want to wish all the teams’ success in Scentworkuk for the future. This was the second trial in as many weeks we hosted in Daglingworth Village Hall. This time, I was helping Ali Brennan (who went on to judging Level 5 for us in the afternoon) judging Level 1 competitors. Again, I was able to judge the outside searches, starting with vehicles, while Ali judged the inside searches. Understandably, some competitor were nervous and eager to call the find on the van, not allowing their dog to go all the way to source, but were lucky enough to call it within 6 inches of the hide. Only Rachel (and her lovely Toller Topic) called it too early unfortunately, however, as they found all the hides in the other areas, they still qualified. On the exterior search, all competitors found the scent – with Sue (and Rio) setting a new record of 9 seconds! Sue and Rio went on to winning the trial – with all competitors passing their Level 1! I can only echo what Ali said in the presentation: The standard was very high and I was impressed by all of the teams. Well done all! First of all I would like to thank Nigel Wilkes for asking me to judge at his level 1 trial, also to my co-judge Tina Schuster and to my scribe who supported me throughout the morning. We were very lucky with the weather, as once the fog burned off we had glorious sunshine. I was tasked with the 2 indoor searches, so we started with Tables and Chairs. The hide was on the outside frame of the chair, at the back of the room. This didn’t faze the handlers and dogs, with 9/10 dogs successful in this search. Had some lovely indications and very enthusiastic searches, including the dog who ran underneath the tables and conducted his search from there, much to my amusement. Some lovely passive indications from Rachel Williams & Topic, Chris Gamson & Rob, Kay Luis & Reno, Shelley Woodward & Quizz, Sue Wood & Rio and Patrick Harte & Rossie. The next search was the Boxes & Luggage, the hide was inside the flap of a box and turned upside down in the middle of the search area. First in was Lynne Humpries & Tripp who performed a lovely search of the area and quickly identified the correct box. 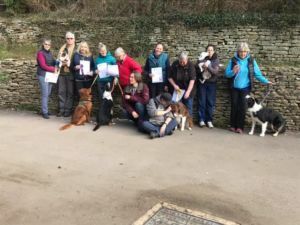 Deborah Williams & Sundae, Sue Wood & Ice and Artaine Harte & PB also performed some lovely searches and again 9/10 dogs were successful in this search. 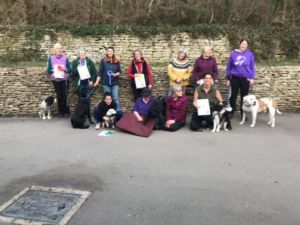 I was really impressed with the standard of the teams that I judged, the indications were lovely, there was no trashing of the search areas, no excessive mouthing of objects and the handlers really praised their dogs when they were successful which is always a joy to see and of course the dogs deserved it. I really hope to see you guys again in the future, keep up the good work and keep praising those dogs. You all were a pleasure to judge. NB a white dog was run for all searches. First of all I would like to say thank you to Nigel Wilkes for asking me to judge his level 5 trial, and also to my fabulous scribe who kept things running smoothly for me all afternoon. Well what can I say other than you guys kept me on the knife edge all afternoon! The first search was an interior search. There were 5 hides around the room, which was quite large. I hid 3 Clove scents on a Chair, a stack of tubes and on a door frame, then used 2 gun oil scents for another chair and a cupboard draw. A white dog was run for all searches. The handlers had a chance to walk around the room before the scents were placed. I saw some fantastic searches from Sarah Taylor & Hugo, Lynne Humprhies & Wotton. Matilda Bell’s Mitford had a very unique way of indicating by literally trying to get the whole object in his mouth, no matter how big it was, but this obviously paid off as they went on to win the trial. 3/10 dogs were 100% successful in this search, whilst most found 4/5 of the hides. The next search was the exterior search. The scents were hidden in a crack on a bench, a hole in the wall, tucked into a drain cover, and a crack in the step. I placed random items around the exterior area, again the handlers were able to view the area to be search. 8/10 dogs were 100% successful in finding all hides, but most dogs found 3/4 of the hides. Laura Ward & Ollie searched the area beautifully, Ollie hadn’t been that keen on the first search, so it was lovely to see him enjoying this search. Sue Kirkham & Tilly also worked very well outside and found all 4 hides, along with Kathy Killick & Star, who is such an honest search dog. Also Denise Pile’s Butty was as enthusiastic as ever, she’s such a keen little dog who loves to search. Alison Williamson & Peppa were also successful in this search. Then it was on to the last search which was a small meeting room and part of the hallway. Again the handlers were allowed to view the room before the scents were hidden. There were 3 scents hidden in a stack of carpet tiles, the underside of a little set of steps, and the underside of a ladder rung. The teams had 3 minutes in this area. 6/10 dogs were 100% successful in this search, with some teams running till the last few seconds before getting the last hide. Yvette Preston & Anya along with Pauline McGeoch & Mirren didn’t struggle in this area. On conclusion the trial was a great success with 9/10 teams qualifying. Some of the dogs were clearly fatigued at the end of the trial, and others were still bouncing off the walls. I love to see dogs search with enthusiasm and I also like to see the bond between dogs and handlers especially when they are successful and share that joy with each other. There were some nice indications, and some handling I was very impressed with. I look forward to seeing you again in the future, keep up that hard work.